My name is Randall Douglas (rhdoug), and I live in rural New York just about an hour or so from Manhattan with my wife of 30 years, Eileen. We have 3 sons, who have all helped (usually) willingly when I needed a hand with the tanks. I want to thank my family and friends who have babysat the tank when we were away, and everyone here at Reef Central whose collective knowledge and experience have helped keep Studio Reef running for over 15 years. I never dreamed that this tank would have the honor of TOTM, I am surprised, honored, and very thankful to all those who were involved in making it happen. When I was about 10 years old my parents got a subscription for me to a wonderful series of books called the Time-Life Nature Library, which covered a different natural subject with each release, from insects to mountains to space. My favorite was "The Sea", where I fell in love with creatures of the oceans. My dream was to someday have a pair of clownfish that lived in an anemone, but I never really thought it would happen. 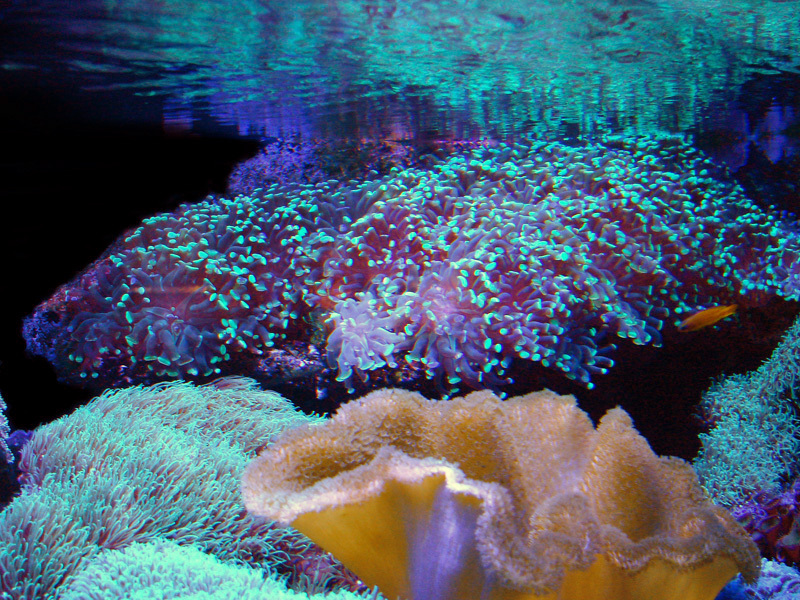 Studio Reef, a 58 gallon mixed reef, was born in the summer of 1999. The name was chosen is because it resides in my home office, an art studio where I animate and create other digital art. The goal for this tank, as with the many other habitats I have built for various creatures over the years, was to make it appear as natural as possible. 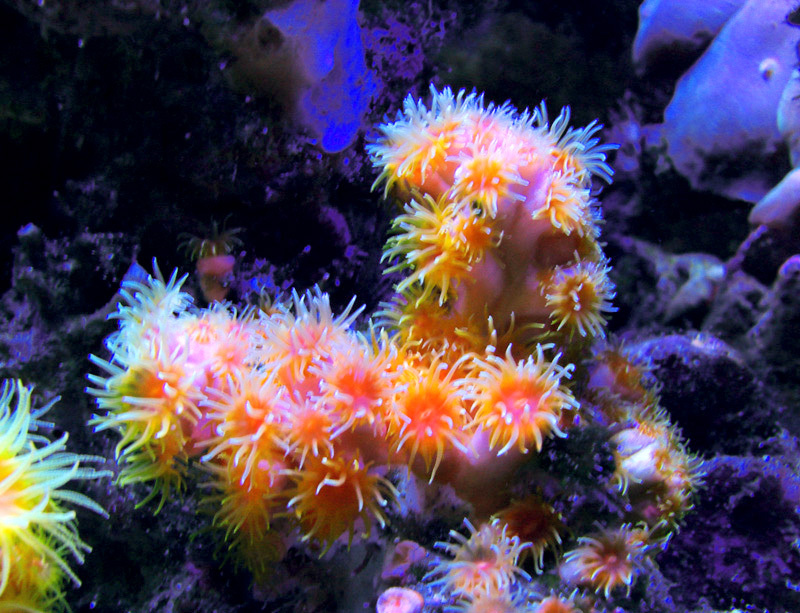 The aquascape is disturbed very infrequently, allowing sponges, foraminiferans, tiny feather dusters, tube worms, and other life to cover most of the rock. This also allows a little algae to crop up here and there, for pods and other small critters. There are some artificial surfaces for corals to grow on as well, like the magnet-supported eggcrate shelf that holds the large hammer colony on the right, and the smaller one that holds the frogspawn on the overflow box. The visible shelf edges are covered with colored epoxy and appear to be live rock. These surfaces are now covered with coralline algae, and other small life in addition to the corals they hold. The tank is fed mix of various frozen foods including mysis, spirulina brine shrimp, plankton, chopped krill, nutamar ova, cyclops, etc. To this I add a pinch or two of various flake foods, and a variety of fine powdered foods including Reef Roids, Gonipower, Reef Chili, and Golden Pearls. Because most of my time is spent just a few feet from the tank, the tank is fed more or less constantly throught the day and evening. I fill the tip of a "Julian's Thing" feeding tool with the food mix, and then suspend it inside the canopy with the tip submerged near one of the vortechs. The food drizzles out slowly over about a half hour to an hour, and is refilled 6 or 8 times a day. 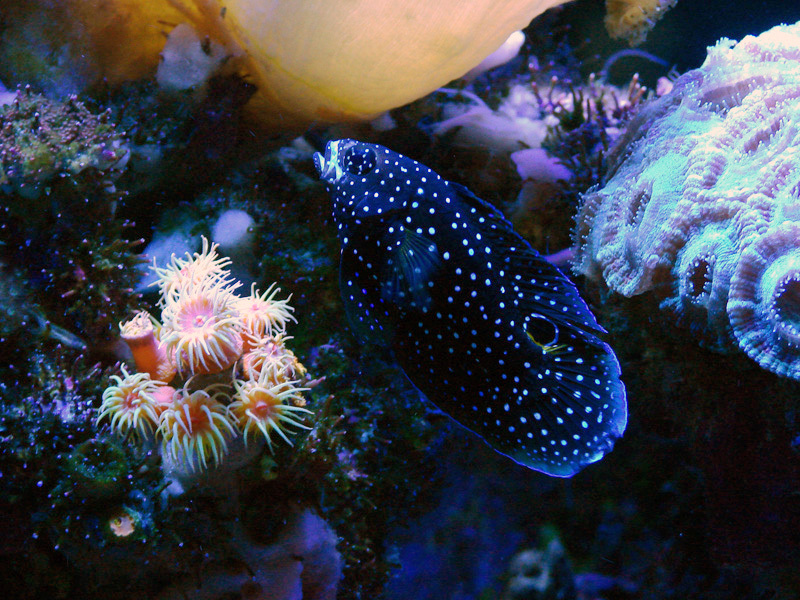 This way the fish and coral get a little bit of food frequently as opposed to gorging a couple of times a day. 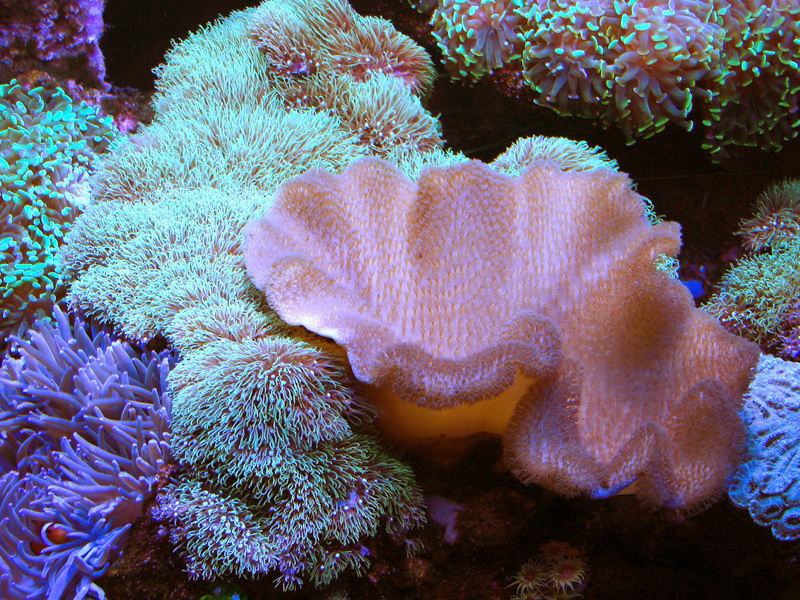 The added benefit is that the sun corals stay open all day! They also get target fed a few times a week as well. 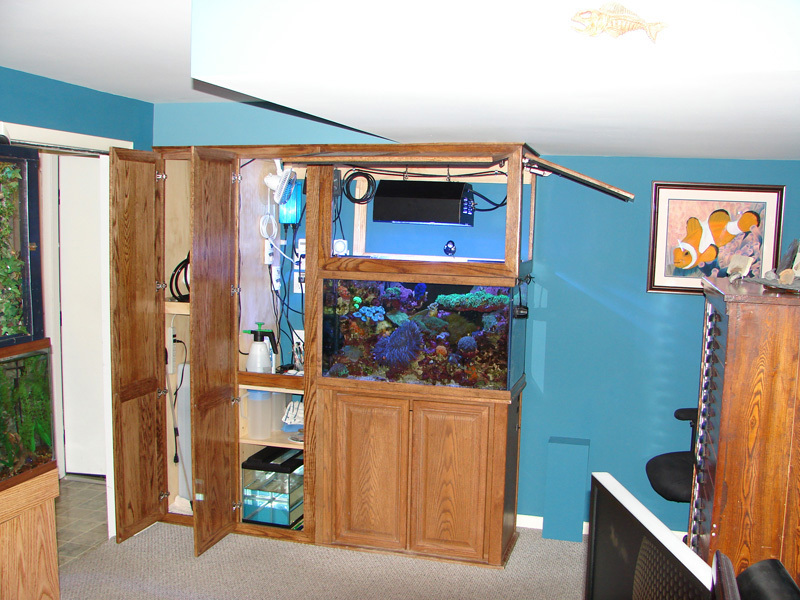 I am sure many reefers would be shocked at the amount of food that goes into this tank. The Scopas Tang and Starry Blenny have algae sheets available daily as well, where they graze together. In fact one will usually not go to the algae without the other. The glass is cleaned daily, and the visible area of the shallow sandbed is usually stirred up a couple of times a week. 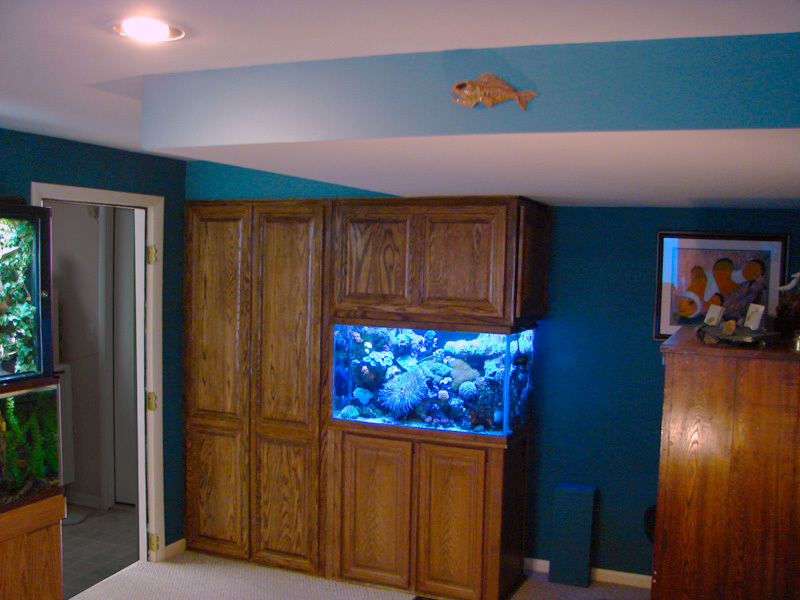 Five gallon water changes are performed weekly. A couple of times a year I "storm" the tank with a canister filter, and really stir things up to get rid of hidden detritus that collects over time. Current livestock, including the dates when they were added. 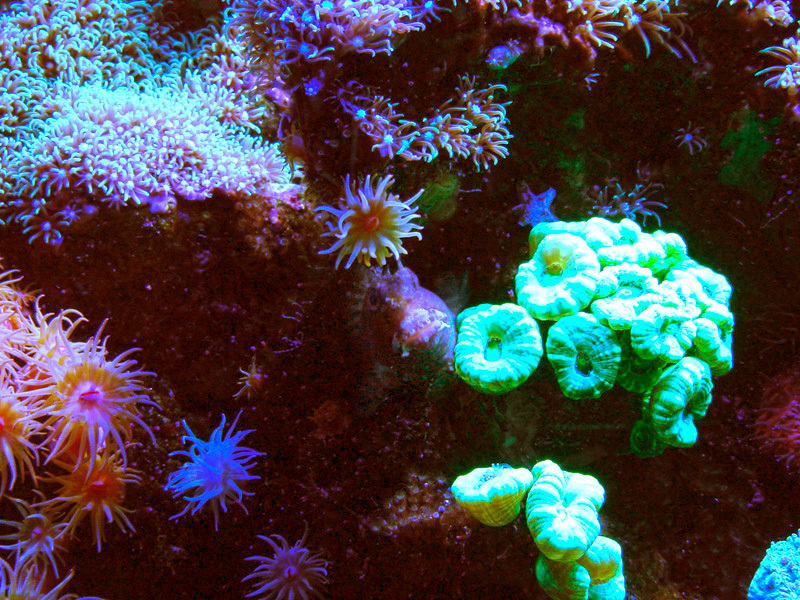 Seven main colonies of sun corals, added from 2006 to present. There are also several babies growing throughout the tank. In September of 2002 I had finally got what I had dreamed of, a pair of tiny gold stripe Maroon clownfish and a Sebae anemone. 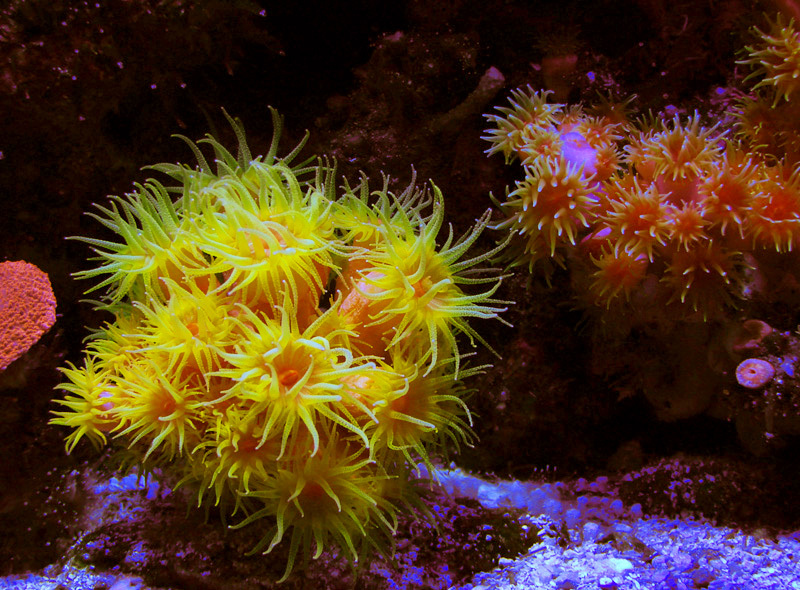 The clowns took to the anemone immediately and moved right in. I realize now how lucky I was for that to happen so quickly. The clowns began spawning in early 2004. I read the Joyce Wilkerson book "Clownfishes" and decided to try and raise the fry. After a few attempts I finally managed to get about 10 or 15 to the size where I could sell/trade them to the local LFS. I raised and sold another couple of hatches thru 2005. Unfortunately, in early December of that year a broken heater in the sump electrocuted the clown parents and all the other fish in the tank. Amazingly, the corals were unaffected, but the anemone must have been traumatized, he went into what I think was a stress-induced spawn the next evening. He survived and is still with me. The tank went without fish for the next month. 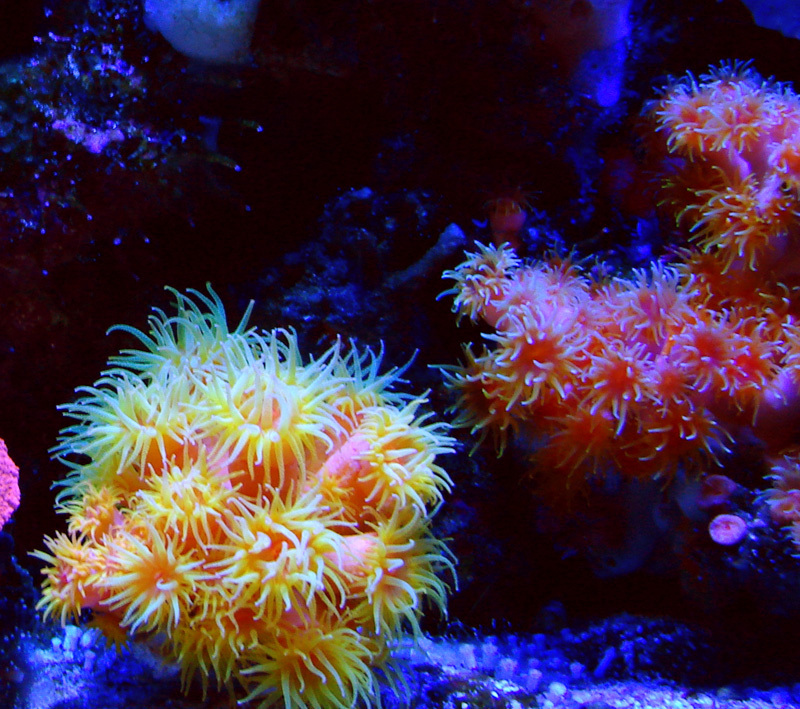 In January of 2006 I picked up an ocellaris clown, who went to the anemone within a day or two. A month later I went back to the LFS for the smaller clown that was being held for me, and floated the bag in the tank so they could see each other. What happened next was amazing. She swam up to the bag after a few minutes, and stayed there until I let her swim into the bag. She escorted the little one down to the anemone, and there they stayed, where they have been spawning regularly for the last 7 years. I have no plans to raise their offspring at this time. In a way, the gold stripe maroon clowns live on. You see, I kept one of the babies from their last hatch in 2005, and he still resides in the 10 gallon tank he grew up in. 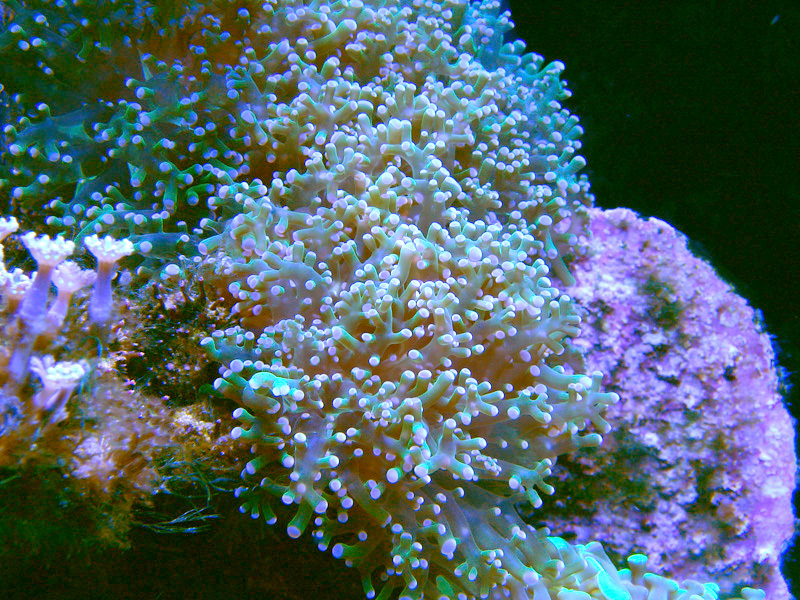 Clownfish Nano is a species tank with only one fish and one type of coral in it, which also came from Studio Reef. 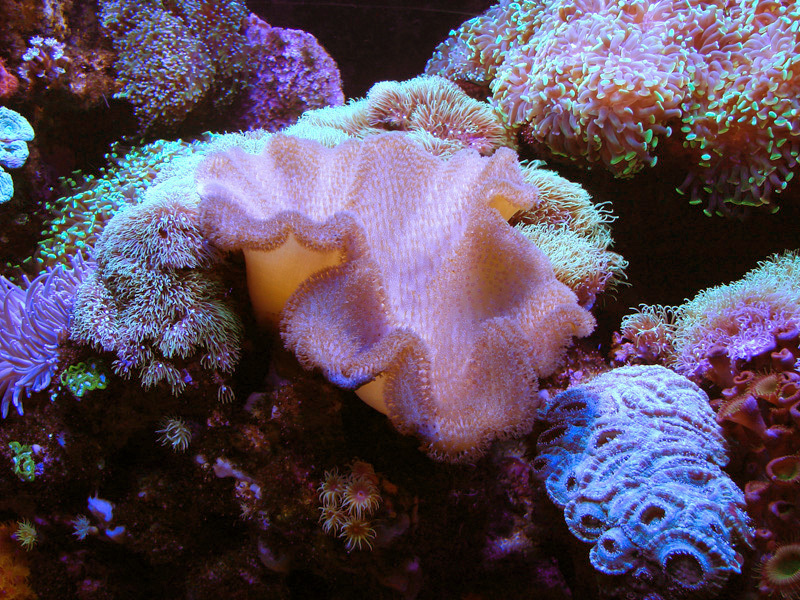 The Green Star Polyps cover nearly every square inch of rock, a good portion of the bare bottom, and the false rock wall which I recently built to cover the filter pipe. The clownfish lives in the GSP's like an anemone, with a few choice "hosting spots". He will be 10 years old later this year, but remains a tiny fish, less than 2" long. Attempts to pair the fish were not successful. 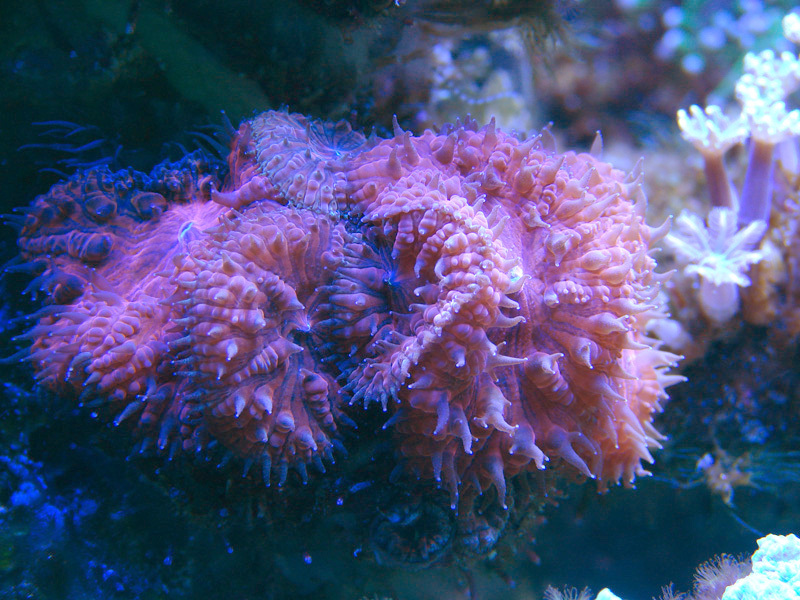 He shares his home with a couple of trochus snails, a very old red hermit crab from Studio Reef, micro brittle stars, asternia stars, and a longspine urchin, which was added in 2009. The urchin is fed pieces of nori or other sheet algae every few days since there is none left for him to graze on anymore. Studio Reef will hopefully continue its journey for many more years, with Reef Central helping to guide the way. * sidebar.... Ironically, a heater malfunctioned in the nano this spring after I wrote this, which claimed the little clown. A new ocellaris was donated by a collegue of my wife's about 2 weeks after, she could no longer care for a saltwater tank. She had no knowledge of the clown or his fate, only that I had saltwater tanks. I am searching for a companion for him.